The skip can be used to dispose of any unwanted materials, furniture or some household goods. This usually comes in most handy during a home renovation project, an office clear out or any other project which requires the disposal of a large amount of waste. What skip size shall I choose? Choosing the size of your skip should be based on the realistic calculation of the amount of waste that you need to get rid of. You should never overload a skip, as they become too heavy for the vehicles to transport safely and legally. Due to health and safety regulations, Cheadle Skip hire are not allowed to collect any skips if the waste rises above the sides of the skip. If you need more space in your skip, you can always hire a second skip. 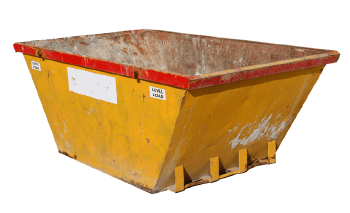 MIDI – A generous medium sized skip that will hold about 5 cubic yards of waste. One of the biggest midis on the market. SMALL MAXI – A good ‘inbetweener’ that will hold about 7 cubic yards of waste. LARGE MAXI – A full size builders skip that will hold about 8 cubic yards of waste. Bigger than most of our competitors will hire you in this category. Skips are very convenient for anybody who would rather not make many journeys to and from the waste disposal centre to dispose of unwanted waste. We can also provide extra convenience by recommending a drop door skip, available in all skips apart from our Mini (2.5 yd). These drop door skips are ideal for easy loading and when using a wheelbarrow. On the other hand, if you have a lot of soil or bricks to dispose of, we could offer you a grab wagon which allows you to remove your waste more easily. What happens to my unwanted waste? You have the added peace of mind that Cheadle Skip hire will recycle 90% of all of the waste placed into the skip. You will need to think about where you would like the skip to be parked. You will need to think about the width between gateposts as well as overhead cables when considering how the skip will be transported to the area. If you do not have a driveway, you may be thinking that you would like the skip on the side of the road. You may need a special permit for this, so contact Cheadle Skip hire for more information. What can I put in my mixed non-hazardous waste skip? Please read and understand before ordering your skip. Skips are for general and inert waste such as soil, garden waste, plastics, wood, old furniture etc. Any waste on the list below cannot be placed in a general waste skip. If you do produce any of the following waste please call 0161 476 3103 to arrange a quotation or to ask for advice. Up to one week – at certain times you can keep it for longer by prior arrangement. Customers are responsible to ensure their waste is carried and disposed of legally. Local authorities can and do prosecute householders when unlicensed contractors fly tip their waste. A waste carriers license – this enables waste to be carried in vehicles. Cheadle Skips carry a full waste carriers license. A waste transfer site license – this enables waste to be disposed of. Cheadle Skips carry a full transfer site license. How much waste do you need removing?